Innovation takes the sharing of knowledge, resources, and goodwill to make any ecosystem equitable and thrive! Help make a difference in the lives of hundreds of students by donating school supplies to those who need it the most. Join the Birmingham Business Alliance, Innovate Birmingham and Hands on Birmingham on Wednesday, July 11 at Innovation Depot for an evening of sipping and service. 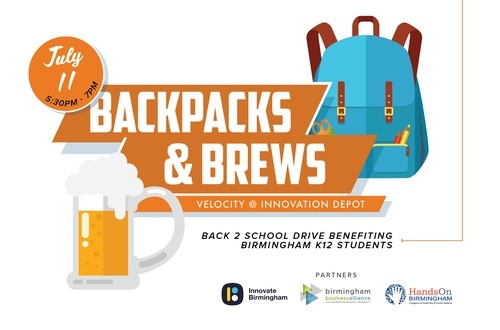 Attendees will help to assemble backpacks with supplies for K-12 students in the Birmingham area. Don’t let the summer pass without impacting the magic.